1874 Black Hills "Custer" Expedition image by W.H. Illingworth. (Much more information in the book "Exploring With Custer" at http://www.custertrail.com). 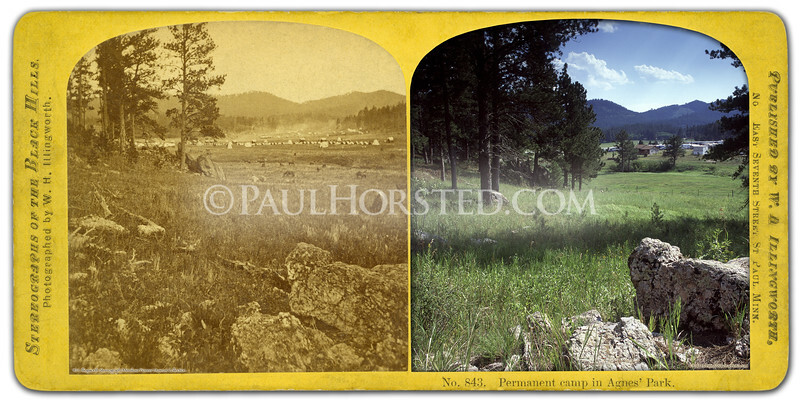 View of "Permanent Camp" of 1874 Black Hills Expedition, 3 miles east of town of Custer, S.D. Tents, horses, and wagons of Custer's men visible in distance. Note same rock in foreground. Historic image courtesy Minnilusa Pioneer Museum, at The Journey, in Rapid City, S.D. ©Paul Horsted, All Rights Reserved.